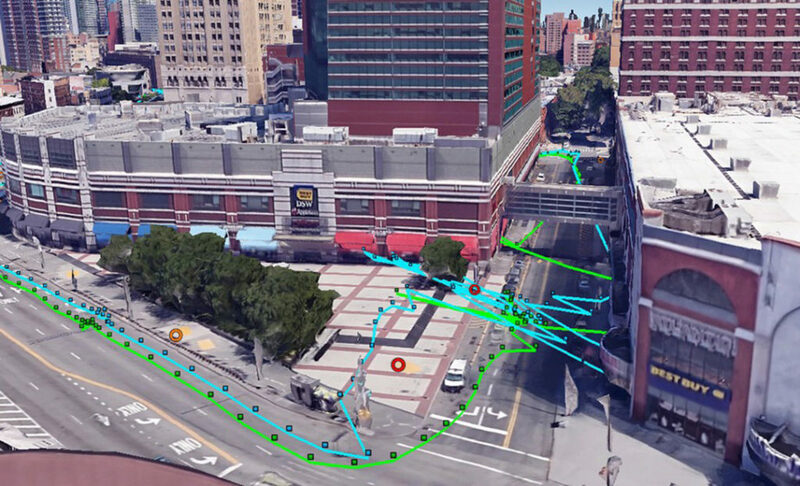 A new map method opens up parking continuous-environment mapping for enhanced low-cost urban navigation. Collectively recorded context data by many identical platforms gather similar sensor readings when operating in a given area. Further processing integrates the data with a map and feeds the summarized results to a user. Complex, dynamic urban environments comprise millions of devices with localization capabilities. While GNSS remains a primary positioning tool, its performance is subject to significant degradation from blocked signals, multipath and non-line-of-sight (NLOS) signal reception. In aided navigation, a positioning filter with GNSS measurements integrates data from various sensors and correction streams to compensate for these disadvantages. 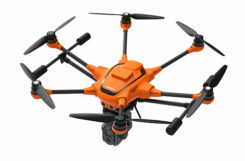 Low-cost platforms are limited with the variety and quality of sensors on board, as well as by processor performance and battery capacity. Positioning routines must be computationally light, energy efficient and make the most productive use of available data. One new research area covers use of crowd-sourced GNSS data. 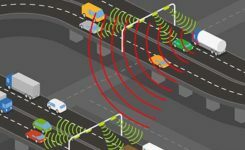 Many vehicles now include some type of native wireless connection capability, which could be complemented by a designated third-party device. The growth in connectivity brings an opportunity to access a stream of sensor data produced by a high number of devices operating in a localized urban area. 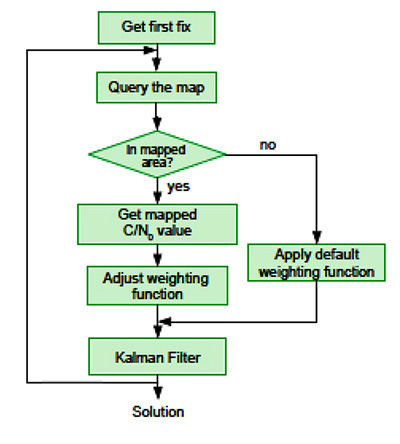 Here, we explore the idea of creating a GNSS signal-strength map using the connected vehicle GNSS data stream and then use the map as statistical information for Kalman filter parameters tuning. This approach improves filter reaction to the environment and produces a positioning accuracy improvement. C/N0 levels of reflected and diffracted signals are more likely to be lower than that of the LOS signals. We propose that the C/N0 level averaged during a given period among all satellites tracked in a given area would correlate with a higher probability of multipath-contaminated and NLOS signal reception. A sufficient number of C/N0 readings associated with a given space-time cube should be collected to compute the statistics populating the signal-strength map. 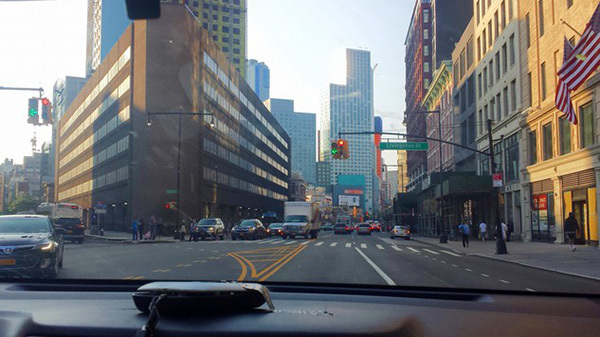 However, the city environment does not remain static: new construction occurs, traffic congestion shifts, and so on. Therefore, the C/N0 space-time statistics must be continuously updated in real time to reflect these changes. Additionally, the solution must be highly scalable as the market of connected vehicles is growing and so is the volume of the streamed data. A recent advance in cloud-based data-stream processing, a data flow model treats an input data stream as something that will never become complete. A derivative of that model is Flink, an open-source framework capable of both unbounded data (stream) and bounded data (batch) processing, while treating bounded data as a special case of the streaming applications. We use Flink as a core library for the environment mapping architecture as it fits the needs of event-time processing while being a highly scalable solution. The processing enables calculating necessary statistics based on a moment of time a reading occurred rather than based on a moment of time the reading arrived at the cluster. The proposed system architecture is presented in Figure 1. 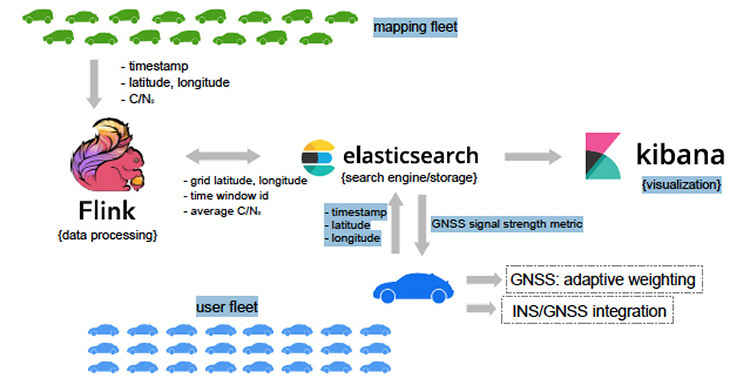 The connected vehicle mapping fleet transmits packets of the GNSS receiver readings via cellular Internet connection to the server at 1 Hz. 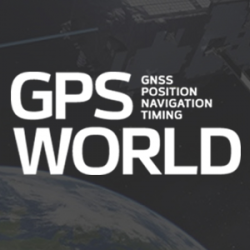 Each packet contains a timestamp in the UTC time system, the geographic coordinates determined by the proprietary positioning algorithms of a connected vehicle, and the C/N0 measurements per each tracked satellite. The geospatial processing block calculates the average C/N0 metric among the readings of a given space-time cube. Computed statistics are sent to Elasticsearch, updating the map in real-time. Elasticsearch is an open-source, distributed search and analytics engine integrated with Kibana, an open-source data visualization tool. User platforms request the average C/N0 metric from the search engine with their UTC timestamp and coordinates and apply it in the processing filter. The system is currently in prototype. Collection of the data populating the map was performed with two positioning boards designed by Parkofon Inc. and installed on the dashboard of a vehicle (Figure 2). Lack of a high number of vehicles for the data collection campaign was compensated with an extensive piloting time (17 hours, 43 minutes) in a limited area, driving the same roads repeatedly. Two areas of New York City were the subject of extensive mapping. Tests concentrated on two sectors with different GNSS signal strengths: sector A, a relatively open-sky area; and sector B exhibiting deep urban canyon conditions. The mapped average C/N0 is denoted as . The of the less obstructed sector A = 39.3 dB-Hz, while that of the more obstructed sector B is lower: 18.1 dB-Hz. This tendency is repeatable throughout the surveyed area and allows for further GNSS signal-strength map integration into the algorithms at the user side. It is a challenge to find an optimal set of urban navigation filter parameters, as the signal obstruction environment changes significantly with the moving positioning platform. Our approach adjusts parameters of the GNSS observation weighting function with respect to the retrieved from the map. The algorithm scheme appears in Figure 3. When the first position fix is obtained, the algorithm sends a request to the server with the timestamp and the coordinates determined at the previous epoch. If one is available in the current user area, the server response includes the metric retrieved from the GNSS signal-strength map. Next, the GNSS observation weighting function is adjusted according to equations given in the full technical paper (see Acknowledgment section). Algorithm performance was evaluated by analysis of the distances between the coordinates calculated with our engine and the centerline of the road in two downtown and two residential areas. For an estimated 86 percent of the track, our proposed map-aided weighting performed better than when the default weighting function was applied during the whole track. The map-aided weighting of the observations brings approximately 25 percent and 35 percent accuracy improvement in the dense urban area and in the intermediate residential environment respectively. Additionally, there were instances of faster solution re-convergence when fix was lost due to insufficient number of the satellites tracked in narrow streets or under obstructions (see Figure 4). 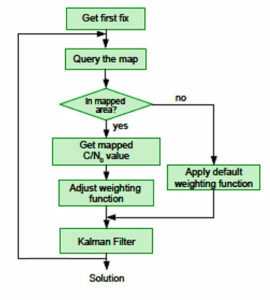 For the mapped average C/N0 levels to be unbiased, normalization procedures must be implemented. This would soften or eliminate hardware constraints on the mapping fleet and facilitate its growth. With more data available, the temporal discretization of the map needs to be implemented as satellite geometry and multipath environment change throughout the day. Optimal dimensions of the mapped space-time cube remain an open question: more real-world data needs to be collected to provide better mathematically-derived estimations. We plan to investigate the benefits of a variable-dimension space-time cube with respect to the area and the mapping fleet density. We also plan to extend the environment map-aided filter tuning to a multi-constellation GNSS approach integrated with inertial navigation systems and other sensors. The technique is commercially implemented in Parkofon, a fully automated parking payment and guidance system that helps people find cheaper, safer and easier parking. The platform includes a mobile app and device placed in the car to guide drivers to open parking spaces in real time and charge them only for actual time parked in designated garages. Parkofon also offers real-time on-street space availability. This article draws on a paper presented at ION GNSS+ 2018. For the full paper, see www.ion.org/publications/browse.cfm. Research is supported by the Natural Sciences and Engineering Research Council of Canada. Experimental datasets were collected with a Septentrio AsteRx-m2 receiver and Maxtena M1227HCT-A2-SMA antenna. Parkofon boards carry a u-blox M8N receiver module and a Taoglas CGGBP.25.4.A.02 patch antenna. IVAN SMOLYAKOV is a Ph.D. student in the Department of Geodesy and Geomatics Engineering at the University of New Brunswick (UNB). EVGENY KLOCHIKHIN is CEO of Parkofon Inc., a smart mobility company utilizing the Internet of Things to guide drivers to open parking. He holds a Ph.D. in Public Policy and Management from the Manchester Business School, UK. RICHARD B. LANGLEY is a professor in the Department of Geodesy and Geomatics Engineering at UNB.